SAN JOSE, Calif., May 1 , 2017 -- SI-BONE, Inc., an innovative medical device company that pioneered the use of the iFuse Implant System® (“iFuse”), a triangular shaped minimally invasive surgical (MIS) device indicated for fusion for certain disorders of the sacroiliac (SI) joint, announced results from two recently published comparative studies showed patients treated with the iFuse ImplantTM were significantly less likely to be taking opioid medications than patients treated with non-surgical care. 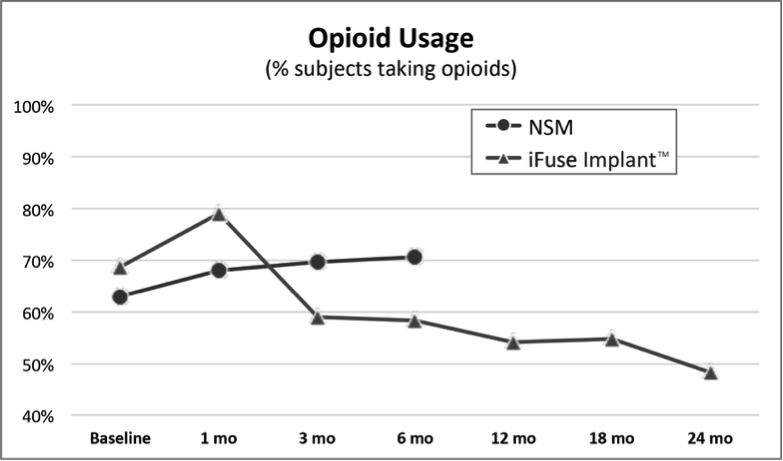 The most recently published paper titled Minimally Invasive Sacroiliac Joint Fusion, Radiofrequency Denervation and Conservative Management for Sacroiliac Joint Pain: Six Year Comparative Study,1 published in the journal Neurosurgery, showed that patients treated with iFuse were 11X less likely to be taking opioids at last follow-up than those who were denied coverage for iFuse and treated with either conservative care or radiofrequency ablation (>80% vs, 7%) (Figure 1, below). 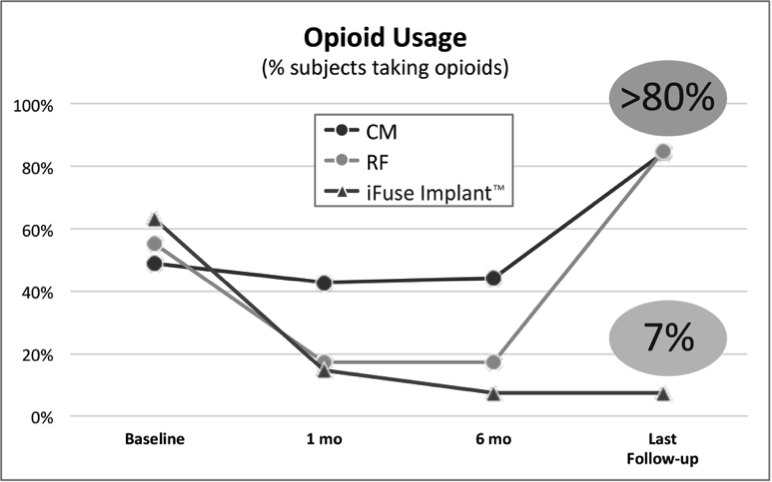 A second publication of two-year results from INSITE,2 a randomized controlled trial of MIS SI joint fusion with the iFuse Implant compared to non-surgical management, showed a 30% decrease from baseline in the number of subjects taking opioids at two years compared to patients treated non-surgically (Figure 2, below). The iFuse Implant System provides a minimally invasive surgical solution to fuse the SI joint using patented triangular titanium implants that create an interference fit within the ilium and sacrum. The triangular implant shape, combined with the press fit insertion, is designed to provide immediate fixation by minimizing rotational motion. The implants have a porous surface that provide an ideal environment for bone on-growth and ingrowth*, facilitating long-term fusion of the joint. iFuse is the only commercially available SI joint fusion device in the United States with published prospective clinical evidence that demonstrates safety, effectiveness and economic benefits, including three large multicenter studies, two of which are randomized controlled trials. Currently, there are more than 50 peer-reviewed publications supporting positive clinical outcomes, safety, biomechanics, and the economic value of iFuse (www.si-bone.com/results). iFuse Implant is the only SI joint fusion device with a FDA clearance recognizing demonstrated improvements in pain, patient function and quality of life following treatment. 1 Vanaclocha V, Herrera JM, Sáiz-Sapena N, Rivera-Paz M, Verdú-López F. Minimally Invasive Sacroiliac Joint Fusion, Radiofrequency Denervation and Conservative Management for Sacroiliac Joint Pain: Six Year Comparative Study. Neurosurgery. 2017 April 20. [Epub ahead of print]. doi: 10.1093/neuros/nyx185. 2 Polly DW, Swofford J, Whang PG, Frank CJ, Glaser JA, Limoni RP, Cher DJ, Wine KD, Sembrano JN, and the INSITE Study Group. Two-Year Outcomes from a Randomized Controlled Trial of Minimally Invasive Sacroiliac Joint Fusion vs. Non-Surgical Management for Sacroiliac Joint Dysfunction. Int J Spine Surg. 2016;10.Article 28. doi:10.14444/3028.